An end in American and Canadian football is a player who lines up at either end of the line of scrimmage, usually beside the tackles. Rules state that a legal offensive formation must always consist of seven players on the line of scrimmage and that the player on the end of the line constitutes an eligible receiver. The old single wing formation showing ends labeled. Before the advent of two platoons, in which teams fielded distinct defensive and offensive units, players that lined up on the ends of the line on both offense and defense were referred to simply as "ends". The position was used in this sense until roughly the 1960s. On offense, an end who lines up close to the other linemen is known as a tight end and is the only lineman who aside from blocking can run or catch passes. One who lines up some distance from the offensive line is known as a split end. In recent years and the proliferation of the forward pass, the generic term wide receiver has come to define both split ends and flankers (wide receivers who line up in split positions but behind the line of scrimmage). The terms “split end” and “flanker” are often ditched today for terms like "X" and "Z" receivers. Bill Carpenter was the first "Lonesome end." On defense, there is a commonly used position called the defensive end. Its primary role is to rush the passer, as well as to stop offensive runs to the outer edges of the line of scrimmage (most often referred to as "containment"). However, as there are no rules regulating the formation of the defense, players at this position commonly take on and share multiple roles with other positions in different defensive schemes. 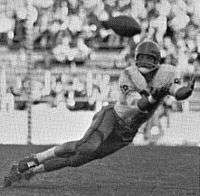 Don Hutson catches a pass. Don Hutson of the Alabama Crimson Tide and the Green Bay Packers was one of the sport's greatest. The self described "other end" opposite Hutson in college at Alabama was legendary coach Bear Bryant. Gaynell Tinsley was another prominent of Hutson's time. Amos Alonzo Stagg of Yale and Arthur Cumnock of Harvard were ends on the first All-America team. Stagg went on to a hall of fame coaching career; some called Cumnock "the greatest Harvard player of all time." Mike Ditka and Ron Sellers were some of the last to play the position in college. 1 2 "All-Time Football Team Lists Greats Of Past, Present". Gadsden Times. July 27, 1969. 1 2 John Grasso. Historical Dictionary of Football. p. 120. ↑ Dan Kelly. "Breaking Down the X, Z, and Slot Receiver". ↑ Jimmy Conzelman (September 6, 1940). "Tinsley as Good as Hutson". St Lois Post Dispatch. p. 38. Retrieved May 23, 2016 – via Newspapers.com. ↑ G.W. Axelson (1913). "Harvard's Greatest?" (PDF). LA84 Foundation.